Part of the charm of steak houses is that whiff of the past, the postwar era of garden clubs and gray flannel suits, when corporate men stalked a Manhattan, as John Cheever wrote, still glowing with “river light.” At Burbank’s Smoke House, with its printed warnings that the management isn’t responsible for steaks ordered well done, or Taylor’s—dimpled burgundy banquettes anchoring it in an era before Koreatown was Korea-town—a barge of garlic bread or crab cocktail has for decades been all the preamble diners have needed before slicing into a hunk of flesh. But Michael Dene has tossed that evocative terrain aside with Chianina Steakhouse, his restaurant in the Long Beach neighborhood of Naples. There’s nothing retro or even very bovine about the look of the place once you get past the Mondrian-like metallic outline of a bull affixed to the exterior. The windowless dining room leans to a stark modernism, with a mural of leafless branches playing off monochromatic acoustic wall panels and recessed bulbs that carefully frame each booth. You could be forgiven for momentarily thinking you were in, say, an upscale Japanese restaurant but for the Carrara marble bar and the pebble-grained upholstery. This stretch of 2nd Street doesn’t have the foot traffic of Belmont Shore, across a short bridge, but neither does it have the frat house atmosphere that open-fronted sports bars bring. In Naples, where day boats are tethered beside the tall-and-skinny houses that line the neighborhood’s picturesque canal, you can wear a sport jacket and not draw stares. Dene, a former executive in the commercial lighting industry, has been operating here since 2007, when he opened Michael’s on Naples, an Italian spot that isn’t so high-end it can’t offer barflies a good affettato misto crowded with cured meats. In 2010, he launched Michael’s Pizzeria, where they leave the wood-fired pies unsliced because that’s how it’s done in the other Naples. Chianina, located on the next block, debuted last December. The restaurant is named after an ancient breed of cattle that toiled as draft animals for Roman legions and is the most authentic source of bistecca alla fiorentina, a four-pound porterhouse that’s a handy counterpoint to any doubts about Italy—home to air-thin prosciutto and pounded veal saltimbocca—being a nation of serious beef eaters. 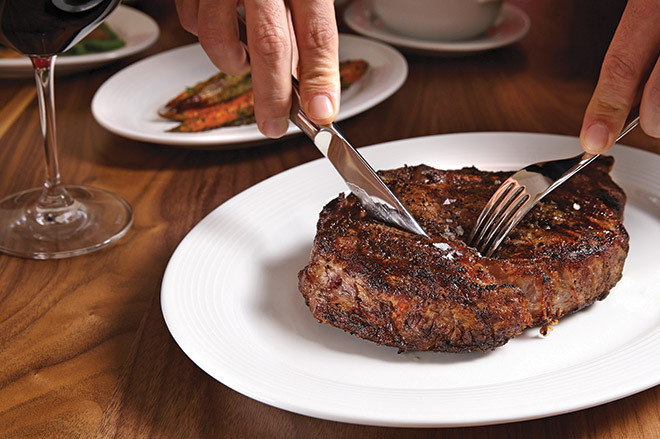 Dene saw the cut as a lodestar for a family-style steak house with prime meats and locally sourced vegetables. To make it authentic, he’s even working with a Chianina breeder in Utah, though the program is so new that none of that beef has yet arrived, and when it does, it will be available only on a limited basis. What the restaurant does offer is grass-fed prime and larger cuts of Piedmontese, another Italian breed that, the waiter will tell you, is “two chromosomes away” from the Chianina. Raised in the regions of Umbria, Lazio, and Tuscany, the breeds share a leanness that you won’t find in the Charolais, from the lush landscapes of Burgundy, or in the Angus, from England’s loamy shires. With so little fat, the best method for breaking down the musculature of the Italian beef is by aging it for at least 30 days before it’s put over a flame and finished the traditional way, with a brushing of herbs that have been tied together and dipped in olive oil. That’s pretty much it for embellishment. The kitchen at Chianina doesn’t celebrate cooking temperature as they do at downtown Long Beach’s 555 East, which has a menu chart with descriptions like “black and blue Pittsburgh style,” or at Cut in the Beverly Wilshire, where the menu elaborates on the specific Fahrenheit setting of its ovens. A lobster tail add-on is available, but I would hardly recommend it. The surf-and-turf combo is only going to get in the way of tasting the meat at its fullest. Firm where Kobe is buttery, muscled rather than marbled (I see an olive mill and cypress trees when I taste it), Piedmontese must be cooked rare or medium rare to reveal its concentrated power. Paradoxically, when too rare, a decent slice can take on the texture of liver. You don’t garnish such quality meat on a whim. If the béarnaise here were airier (bordelaise and horseradish are other options), I might put a dollop on the side of the plate, but the sautéed duck liver (an “addition” on the menu and a lot like foie gras) only makes things greasy (and adds $28 to your bill). For me, the simplicity of the roasted rapini mined with cloves of browned garlic is just the thing to underscore a charred New York’s rustic force. Coleman lights up a fillet of halibut with a smooth artichoke puree and Meyer lemon confit. There’s something fabulously satisfying about the pan gravy the kitchen spoons over the roasted half Jidori chicken; perhaps the congealed sauce of the towering lamb shank could achieve the same if it were stretched out with a little stock. A hint of thyme rises above the stupendous side dish of mushrooms, a medley that ranges from the nutty multi-gilled buds of chanterelles to hefty trumpet mushrooms cut lengthwise to accentuate the soft flesh of the stems. Although the deliciously roasted fiddlehead ferns among the mushrooms are foraged in Oregon, many of the other ingredients are from nearby Farm Lot 59, which sits on a reclaimed oil field. You hear the farm invoked with some frequency as the waitstaff makes the rounds, and although locavorism is nothing new, their enthusiasm underscores how the restaurant wants to reframe the steak house, not reinventing the menu but nevertheless nudging it into the present. Delicate whole heirloom carrots are roasted darkly and dusted with cumin, while the cauliflower florets are roasted and sprinkled with cayenne as they would be at your local gastropub. I wouldn’t say that cutting a head of iceberg into a disk rather than a wedge, as Chianina does, is progress—you wind up with more chewy rib than crunchy leaf—but in the bright bitterness of the market salad, you taste the benefit of an ingredient that’s barely had to travel a single freeway exit. Though the menu doesn’t come at French cuisine as directly as it does at Italian, there are plenty of Gallic flourishes scattered about. Coleman cooks diver scallops to a tender pearly white, placing them on a ring of pommes Anna, crisp potato rounds that contrast with the flesh and soak up the buttery saffron sabayon. He also fashions a fairly powerful mignonette—a mix of shallots, cracked peppercorns, and vinegar—to frame the purity of a half-dozen Tisbury oysters. An even better interpretation is the baba au rhum, a yeast-raised beauty that confidently gets away from the tired cheesecake with which so many steak house meals end. A softball-size brioche soaked in rum, it’s a veritable cloud of dough sitting in an amber syrup with candied fruit and Chantilly cream. Where the usual baba is an individual serving, this one is operatic—enough for two. Big portions make sense. Steak houses have always represented our homegrown opulence, a sense of abandon even a Puritan can live with. During my four meals, the waiters would don white baize gloves when laying new cutlery on the table. I guess it prevents smudges on the silverware, but it also feels like strained, old-school formality. Dene doesn’t need to force the issue. The care shown for the beef is enough of a link to the heritage of this kind of restaurant, and it takes us beyond—to the open range and to one of the most elemental ways of eating. You won’t find a baked tater here, but there are no fewer than five gorgeous variations, from baby butterballs roasted with rosemary to russet gnocchi to a Yukon gratin that arrives in a ramekin, its brown, bubbling crust hiding a moist interior. The buttery richness and cheesy crust so beautifully parried the leanness of the Piedmontese rib eye one night that it took me to a forgotten place. 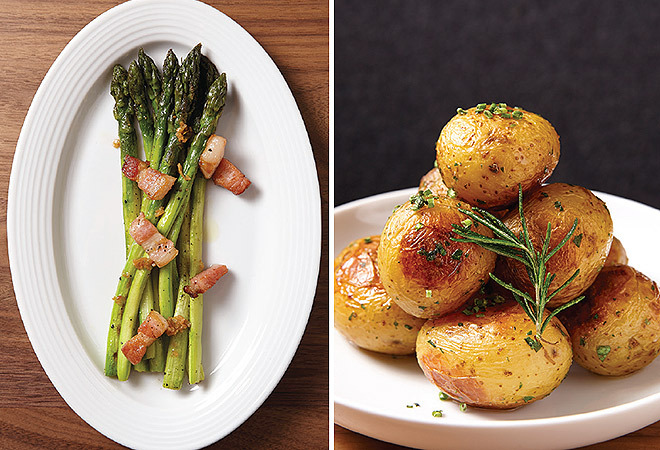 Meat and potatoes—could anything be simpler or as good?